The L12RCY/P is a mid-woofer from the Seas Prestige series. It uses a stiff and light aluminium cone coupled to a low loss rubber surround and it shows no sign of the familiar 500-1500 Hz cone edge resonance and distortion associated with soft cones. The extremely stiff and light cone gives bass precision and a nice midrange detail. High temperature voice coil wound on an aluminium voice coil former gives high power handling capacity. An extra-large magnet provides high efficiency and low Q. This driver is a very nice small mid-woofers and even though it’s not a SEAS Excel W12CY001 it can be called “Excel light” giving almost 75% of the Excel:s performance, but at a third of the Excel:s price. For its size it has great woofer capabilities and has an overall smooth frequency response characteristic up to the cone break-up at 9.2kHz. This cone break-up needs to be taken special care of with a special notch filter in the cross-over filter design. Failure to take care of the cone break-up results in a driver unit with a very fatiguing sound and that “rings like a bell”. This loudspeaker driver unit needs to be crossed over low in frequency in order to keep the odd order harmonics distortion at bay. I recommend a cross-over <2500Hz. The samples are an almost perfect match between each other and they have a very smooth impedance response curve with no signs of any resonances besides the cone break-up at 9.2kHz. The Fs is lowered by 4-5Hz, but otherwise they have the same smooth response curve as the “cold” driver units. Driver position: Mounted on center-line with driver unit center 10cm from bottom of the baffle. Nice consistency between the two driver unit samples. 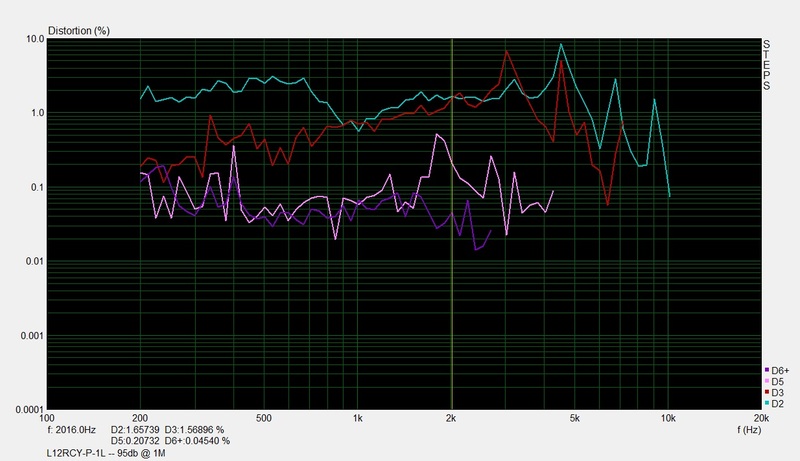 Downwards sloping frequency response from 2kHz. Heavy cone break-ups at 9.2kHz, 13.8kHz and above. The cone break-up at 9.2kHz needs to be corrected for with a notch-filter in the cross-over. The mid-woofer has cone break-ups at 9.2kHz and 13.8kHz. These break-ups show up in the 3rd harmonics at 3kHz and 4.6kHz and at the 5th harmonics at 1.8kHz and 2.7kHz. The 2nd order harmonics is slightly higher than the 3rd order up to 1kHz. 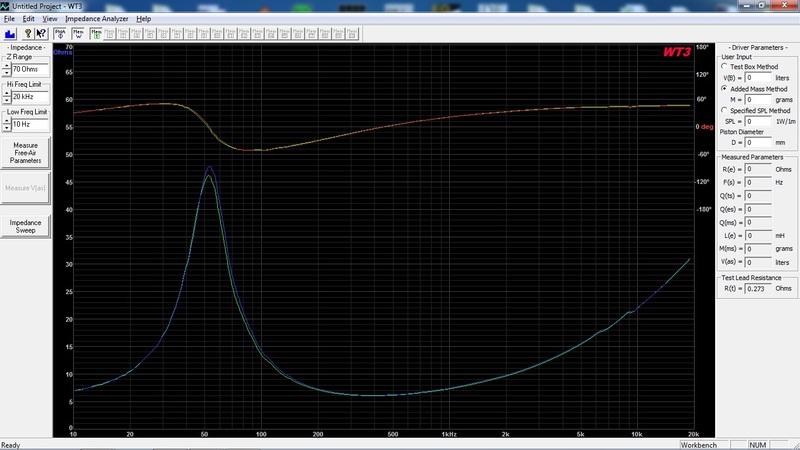 It has low odd-order harmonics up to 1.8kHz. This driver is optimally used with a cross-over <2kHz, but it can be used up to 2.5kHz depending on how steep the cross-over filters are.